Application: Large areas, high gloss acrylic colours, washes & weathering using acrylic paints, illustration, t-shirts. Use With: Airbrushed acrylics, thinned acrylics. Tip Technology: Eliminates needle adjustment. Easy Cleaning: Paint only enters the nozzle, so it is the only part that needs cleaning. Less Parts: The screw-in Aztek nozzle is the only part that ever needs to be replaced. They are imprevious to solvents so they last a long time. Standard airbrushes get covered with paint, requiring complete disassembly to clean. Aztek requires no disassembly. Paint travels directly to and through the nozzle, entirely bypassing the airbrush body. 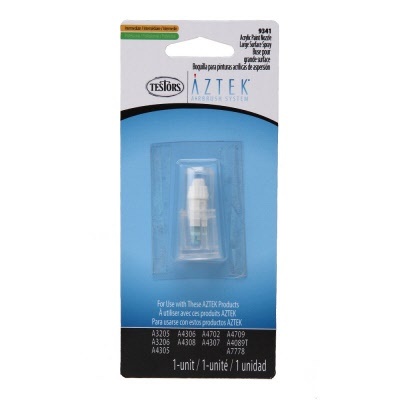 Aztek lays down a full range of special effects without time-consuming, complete needle adjustments. Tip technology allows user to quickly move from one spray pattern to another by simply changing the tips. Thoughtful ergonomic design comfortably fits in the hand, reducing fatigue and providing a good grip while spraying. The airbrush body is also impervious to solvents.